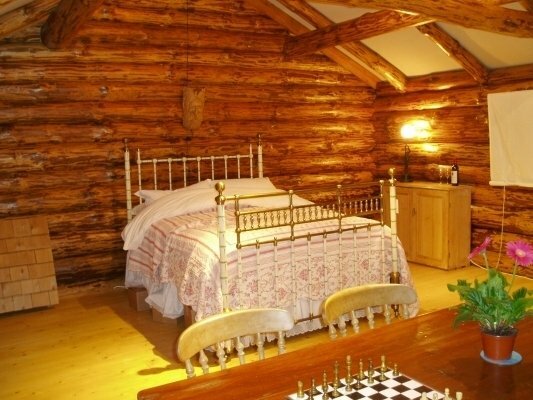 We will work with you to create a design for your log building that exactly suits the purpose you have in mind. Although each of our buildings is different, we have collected over 70 designs, and any of these could become the basis for your own building. We know these designs work, so meeting your requirements is made easier. Good foundations prevent rising damp and the roof should keep water off the walls, so our designs incorporate foundations and roofs that take both location and use of your building into consideration. You can choose just about any roofing material you like – tiles, tin, shingles, thatch or even grass – as along as it keeps out the water and is not made of asbestos. 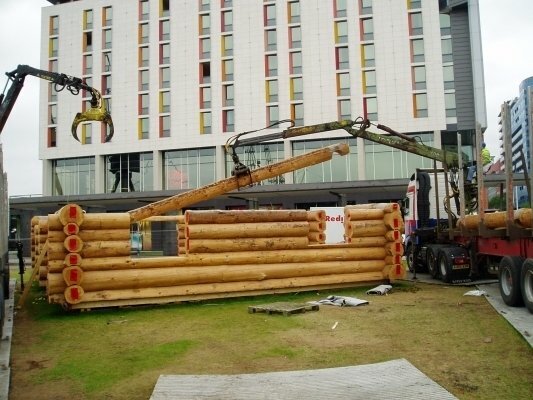 Not all log building suppliers give you such freedom to express yourself! Once we have the design, depending on the size and use of your building, you may need to obtain planning approval from your local authority. 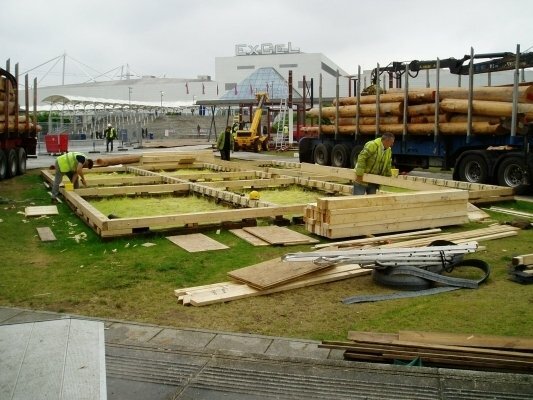 This can be a very involved and time-consuming process, and some “log cabin” suppliers do not help with this. We can advise you, and will work closely with the planning department on your behalf so you don’t have to be involved. See more about planning and building regulations. We always take care of construction for our clients. 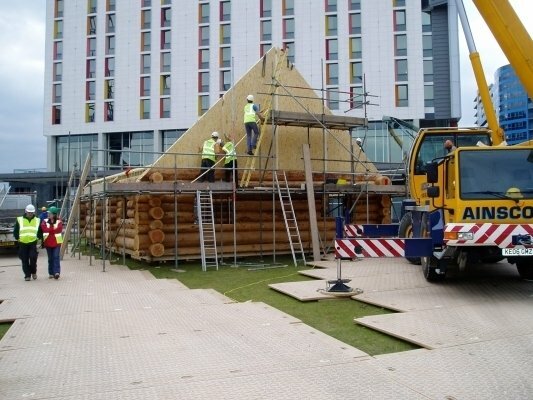 You can find log cabins that you erect yourself, but we don’t expect you to be expert builders, or to pick your way through building regulations. 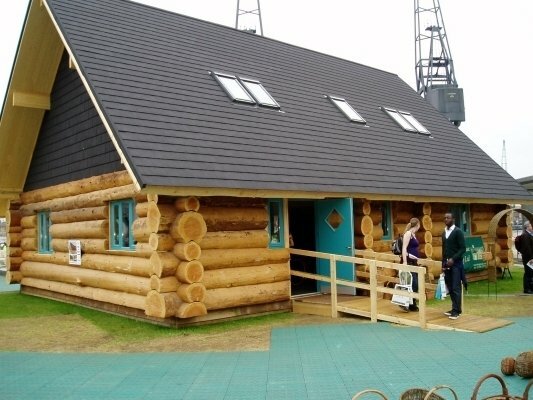 The traditional building skills we use take time to perfect, and because we build to recognised standards, your log house, log cabin, granny annex or home office will be a quality building constructed to last. 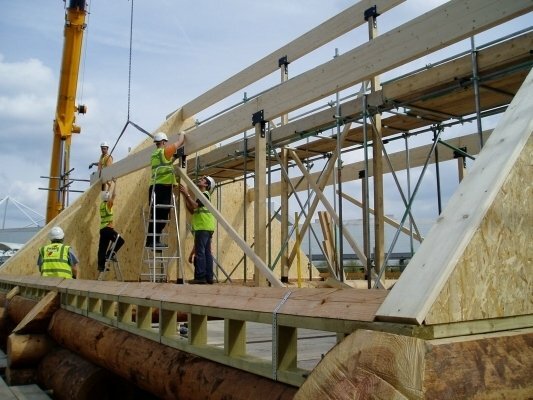 We can also build using standard timber frame. Some buildings, such as studios, home offices and games rooms, can be built with a timber frame and sawn timber cladding – we build this way for clients who want a wooden building but prefer this style to the traditional whole log. 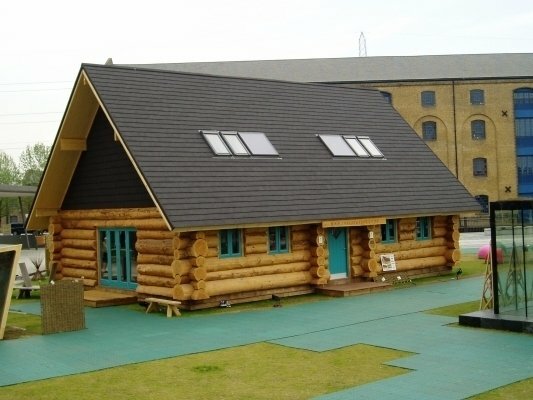 Such buildings are all designed and constructed to individual requirements, and therefore have a more stylish finish than similar, mass-produced buildings often described as “log cabins”. 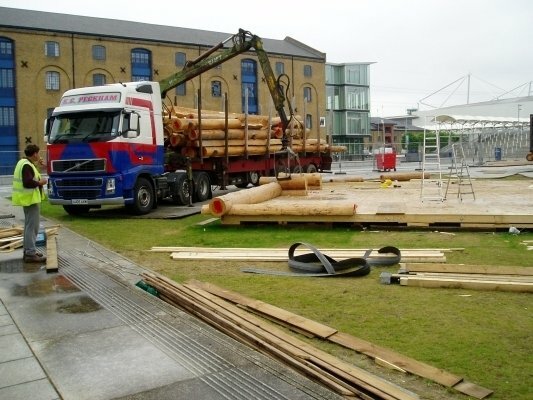 We select each Scots or Corsican pine or Douglas fir log from managed woodland, including The Forestry Commission. For each tree felled at least one more is planted. Wherever possible we source trees locally to minimise the impact on the environment in transporting them. 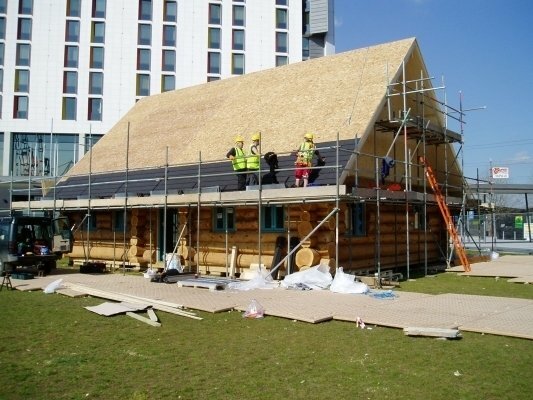 We also conserve timber – fewer trees are used to build with whole logs than are used in similar buildings made of commercially sawn timber. Our logs are felled by hand so as not to damage them, hand peeled and then cut to fit snugly on the one below. We do not machine the timber because this makes the logs uniform and gives the appearance of a building made from telegraph poles. 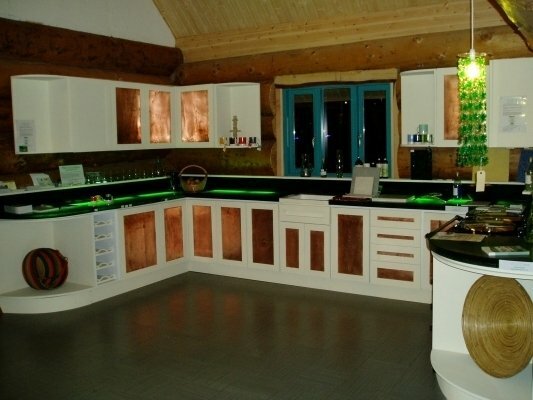 enhances the beauty of each individual piece of timber, and gives the finishe product a unique and aesthetic finish. creates buildings that are extremely solid. 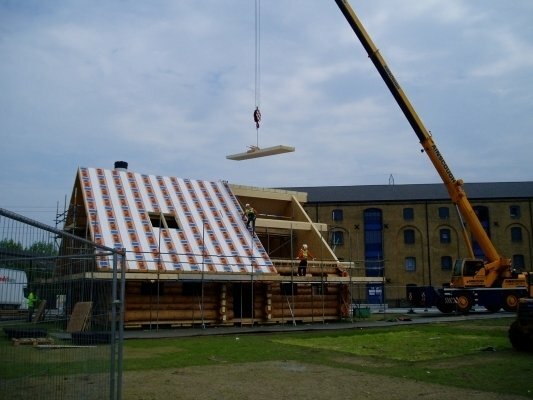 Unlike log cabins made of flimsier material or less robust construction our buildings will not warp, move or shift. Some of our logs can weigh over half a tonne each! produces thermally efficient buildings, so they will keep your heating bills down in the winter, and provide you with somewhere cool in the summer. You can also add insulation to floors and roofs. 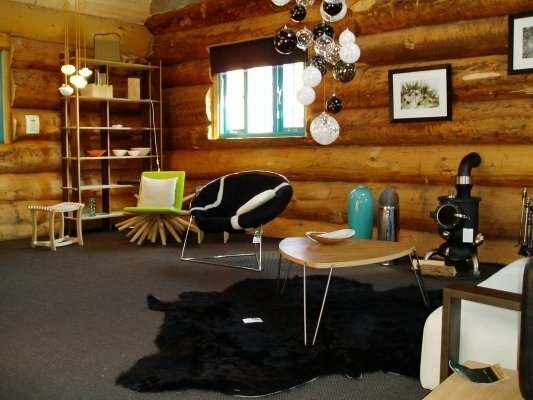 See more about the properties of logs. gives rooms an acoustic quality which enriches sound, voices and music. Day-to-day clatter is muted as it does not echo around as on plaster or thinly constructed walls, so your building will remain a tranquil place in which to live or work. exudes a natural aroma of sap and resin and gives a pleasant background scent to your environment. 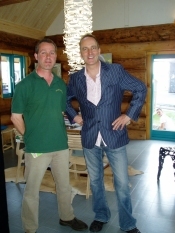 The Log House Company provides the information below in good faith and as a guide only. We always advise checking with the individual authority, as regulations may differ. Information is available from www.communities.gov.uk and from your local council. Planning permission is generally not required if a building is for the use of the occupants and classed as incidental to the enjoyment of the main dwelling. If the purpose is intended for either business or accommodation, advice should be sought. Most councils are very helpful and we advise always checking with the local planners first. 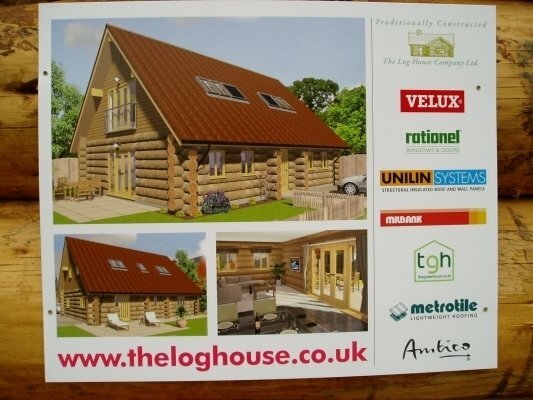 The Log House Company is able to work on your behalf with the relevant authority, please note, some costs may be incurred for this service. “Permitted development” is the right to carry out certain limited forms of development without the need to make an application for planning permission as granted under the terms of the town and country planning (general planning development) order 1995. The total ground covered by all outbuildings must not exceed 50% of the total area of the curtilage (excluding the ground area of the original building). In the above cases, you need confirmation from the local authority to ensure permitted development applies. If the internal floor area exceeds 30m² or any part of the building is within 1m of the boundary, then building regulations approval will be required. If the building is to be temporary (not more than 28 days) then no regulations apply. The building regulations approval is needed for the structural calculations in accordance with the department of the environment (DOE). A mobile home comes under the mobile home act of 1983 alongside the 1968 caravan act (living accommodation). A mobile home is for habitation, not incidental use and restricted to 20 feet wide (increasing to 22 feet from 2007) and 60 feet long, excluding overhangs and verandahs. The building must be moveable (i.e. mobile) and be delivered in no more than two parts. A mobile home is excluded from V.A.T. and generally from building regulations – but will require planning permission. Land with a CLD (Certificate for Lawful Development) has a right for habitation on that land. If a building is assembled as opposed to constructed on site, then building regulations are not normally required, the building is seen as "non permanent". A granny annex is a dwelling for a dependent family member and falls under different criteria. A temporary or non-permanent structure is more favourably looked upon by the planners and may be a lot easier than you think. 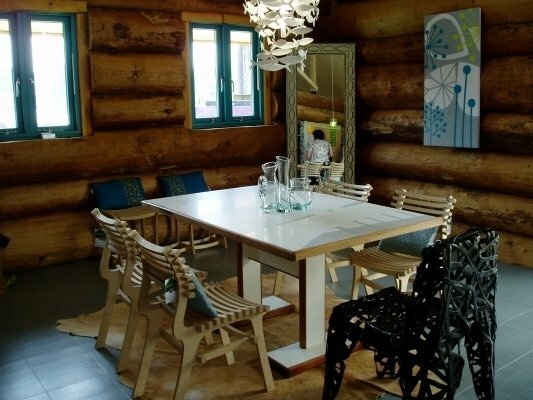 Wood is one of the best building materials because of its strength and resistance to transmitting heat or cold. The thermal efficiency of wood can be measured in different ways, and its thermal properties expressed as a value. Most pines offer thermal conductivity at an average value of 0.9 to 1.5 W/m°C. This is the “R” value. A one-inch thickness of our wood will have an “R” value of 1.3 (rising to1.5 in certain conditions). The "U" value is a measurement of thermal resistance. This value is calculated by adding up the individual components’ “R” value, for example, the logs in a wall, and then finding the reciprocal. To make more sense, a material is given an "R" value, which is an indication of resistance to heat flow of a specified thickness. Materials with a high “R” value have superior insulating qualities. Conversely, the lower the “U” value, the better the thermal resistance. 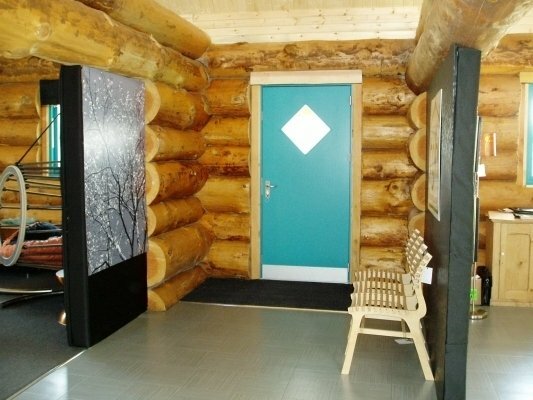 Timber used by the Log House Company has an average “R” value of between 1.3 and 2.1 per inch of thickness at 10% moisture and 73°C temperature. 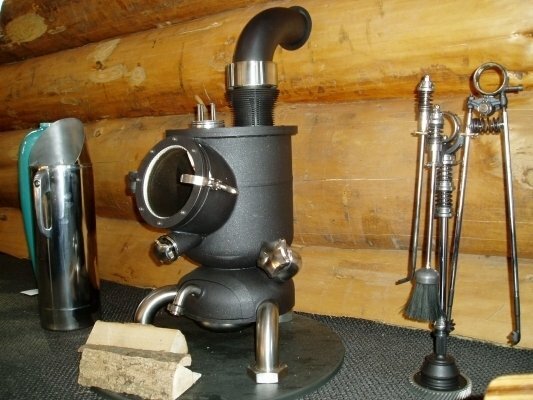 The value will vary with moisture content, density and temperature! By using logs with a mean diameter of 16½ inches and insulating floors and ceilings as well, The Log House Company can build to 0.35 U or better. Scots pine and Douglas fir have a modulas to rupture parallel to grain of 14 and 17.5 MN/m², respectively and a shear strength of 1.5. The durability largely depends on moisture content being below the limit conducive to fungal attack.